Considering that the British invented the tank, their WWII tanks were terrible. Combat experience against the Germans in the Western Desert Campaign demonstrated to the British the inferiority of their tanks. A request was thus made to Leyland Motors Ltd for a new tank that could achieve combat superiority over German models; for reasons of economy and efficiency, it additionally had to use as many components of their Cromwell tank as possible. 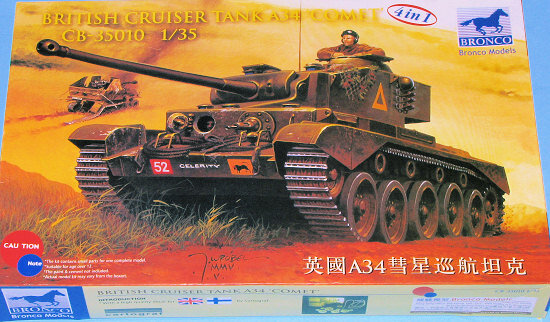 The initial design was the Challenger, basically a 17 pounder anti-tank gun mounted onto a Cromwell chassis. The large weapon required a decrease in armor as well as other design concessions, and ultimately production was stopped after only 200 units were built. In a second attempt (the A34), the tank designers opted to use a highly-modified version of the 17 pounder, the 77 mm. The new gun was still of the same 76.2mm calibre as the 17 pdr, but was designated "77mm" because it used ammunition that was different and non-interchangeable with the 17 pdr, and also had a lower muzzle velocity than the original gun. Several other upgrades were added as well: armor protection was increased, both the hull and turret were of welded construction with a cast mantlet, ammunition was now stored in armored bins, the suspension was strengthened, return rollers were added, and the turret was electrically traversed (a design feature taken from the earlier Churchill tank), with a generator powered by the main engines. The first prototype was ready in February 1944 and production models began to be delivered in September. By the end of the war, 1,200 units had been produced. The British 11th Armoured Division was the first to receive the new tanks in December of 1944 and the only division to be completely refitted by the end of the war. Because of its late arrival, the Comet did not participate in any major battles though it was involved in the crossing of the Rhine and the later Berlin Victory Parade in July 1945. The Comet tank's maximum speed of 32 miles per hour was greatly exploited on the German Autobahns. During the following Korean War, the Comet served along with the heavier Centurion, a successor tank introduced in 1949 partially based on its design. The Comet remained in British service until 1958 when the remaining tanks were sold to foreign governments; up until the 1980s, it could be found in the armies of various nations such as South Africa. The Comet MK I model B was also used by Finnish Defence Forces armoured brigade until 1980. Molded in an appropriate olive brown plastic, Bronco has put each sprue into a separate bag to protect the parts. I did a thorough look at the bits and only found a few sink areas (all easily filled), no flash and no inappropriate ejector pin marks. Molding is superb and detail is quite crisply done. Some even have part numbers cast into them. The kit also includes an etched metal fret and a section of twine to use for the tow rope. Tracks are the single piece 'rubber band' variety. Now this latter may seem like a step backwards in a relatively new mold and somewhat expensive kit, but aside from the difficulty of painting these vinyl tracks, many would rather have these as they are much easier to deal with. The kit has a base hull onto which one puts the side pieces for the suspension and then attaches the upper hull. There is a small pack of four WWII variety idler wheels, which the instructions say are resin, though they do look just like the plastic ones! Though there is no interior, the gun breech is well detailed. Apparently the photo etched parts either replace some plastic ones or are used for specific versions (like the exhaust shields for late WWII variants). 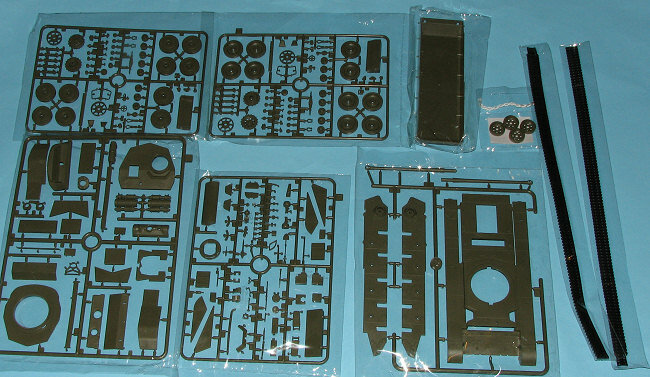 In fact, one aspect of this kit is that you can do several different modifications depending on the era in which you wish your tank to be. The instructions are quite clear on which bits are for which version and the modeler has to pretty well know which he wants to do from the start. Instructions are well drawn, but a tad busy in places. Color information of a generic type is provided during the build sequence. There is a color chart providing paints in a number of different brands. There are markings for six tanks and they are either in British Olive Drab #15 for the four WWII British tanks; Deep Bronze Green for the Hong Kong tank in 1957, or Field Green for the Finnish tank that used the Comet from 1961-1980. 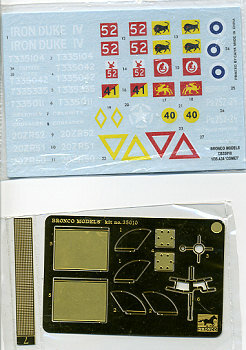 The painting and markings guides are actually quite small, so it is a good thing there are few markings. Decals seem to be well done and I would hope so I doubt there are any aftermarket replacements. So there you have it. What looks like a superb kit of an important piece of British armor. Having all those options is a real plus and for those who just can't stand band tracks, I'm sure there are many aftermarket replacements available. If you would like your product reviewed fairly and quickly by asite that has over 350,000 visitors a month, please contactme or see other details in the Note toContributors.